He was born in Aydingun village of Salyan region on 7 February 1975. In 1992 he finished Aydıngün village secondary school and after that, for some time, he worked at the state farm. In April 1993, he was called to join the National Army. And he went to the front in order to take part in military actions to protect our lands. He fought bravely in Fuzuli and Tartar regions. In May 1994, it was the beginning of the happy time when our soldiers declared a cease-fire between Armenia and Azerbaijan. In spite of losing part of our lands, we did need some time to breathe and gather our strengths back. On March1995 our state is again under threat. The country was experiencing anxious days. The forces that were trying to strike our statehood have intensified again. The enemy remained on one hand, and we were abusing ourselves by our own selveson the other hand. Thanks to the strong will of the national Army the threat was removed. Nazim Babayev also had great services in the removal of the forces which committed the state coup attempt. He, who survived Armenian bullets and aggression unfortunately, fell by the bullets of own our fellow citizens. He closed his eyes forever, on March 15, 1995. 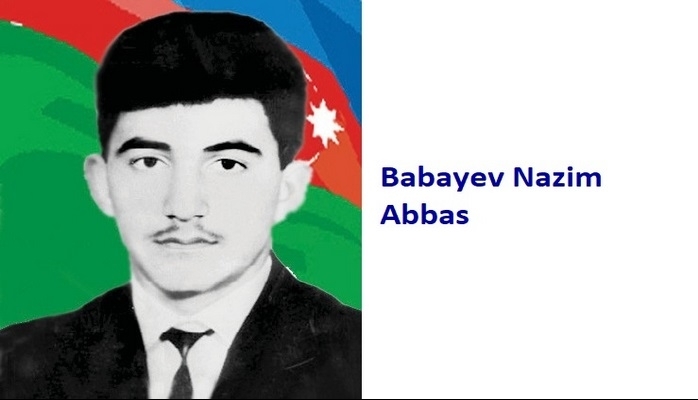 Babayev Nazim Abbas was posthumously awarded the title of "National Hero of Azerbaijan" by the decree № 307 of the president of the Azerbaijan Republic on April 4, 1995. He was buried in the alley of Martyrs in Qarachala village. In Salyan city, one of the streets is named after him. There is also a bust of him in the park of Salyan city.